Y’all! Coming back from an injury (TL:DR- Runners Knee) is no joke. And the HMTT (or The Half or The Half Marathon Training Team) was an incredible resource for this year. I *think* I’ve posted about the training team previously, but if you’re feeling TL:DR: it was great. Jeremy and I registered for the training team with our desired information. The first day we were in separate groups. We decided we’d go ahead with whichever group we were placed in and report back on which group was better. We picked my group, The Falcons. We made several friends in the group. My frequent running buddy was also named Nicole. We loved having structured, supported runs every week. The training guide they produce is also fun. I think I documented my progress for at least half if not three quarters of the training time. Race day. Our friends the Pullams gave us a personal VIP experience. We parked our car downtown the night before, near the finish line. Best idea ever. Kathryn drove us home and we were good to go. Jason and Kathryn picked us up the next morning super early- yay for a runner host- who gets my insane need to be super early to a race. We dropped off our bags, keeping our throw away clothes and what we wanted during the race and then Kathryn let us in to our top secret, toasty warm, clean bathroom waiting area. Let me tell you, waiting inside was magical. We made our way to our corral close to the start of the race. Found some friend we needed to take pictures with and started our race. I had in my mind the pace I wanted to run (9:40 min/miles) and the mile markers where I’d make decisions about how I felt, with plans to speed up throughout. I MUCH prefer a negative split race. And my race went nothing like I’d planned. I maintained a really nice pace for the duration of the race. Hard, but not unbearable and intense enough that I was delighted. Kathryn and Jason found me a couple times throughout the race. It was incredibly wonderful to have a personal cheering section and paparazzi. Also side note: All of the shirts for the 13.1 runners… ugh. The cotton shirt is orange, the singlet was neon orange and the long sleeve was tomato soup red. Thankfully a kind friend traded me her blue (Marathon) shirt for my red. I have previously survived the full race otherwise this would feel weird. I tried to smile every time I saw a photographer. I think I did pretty well. Here’s Nicole, Jeremy and myself at the finish on Brown’s Island. Unbelievably thrilled with my finish. 9:05 min/miles overall for 13.1 miles. In general this is a super awesome race. If you need or want a first marathon or half marathon, the folks at Sports Backers have it going on! (*I can say this with a lot of confidence because I just ran the BolderBoulder 10k ~50,000 runners and Sports Backers wins hands down for organization of event). 2014 was going to be my year. 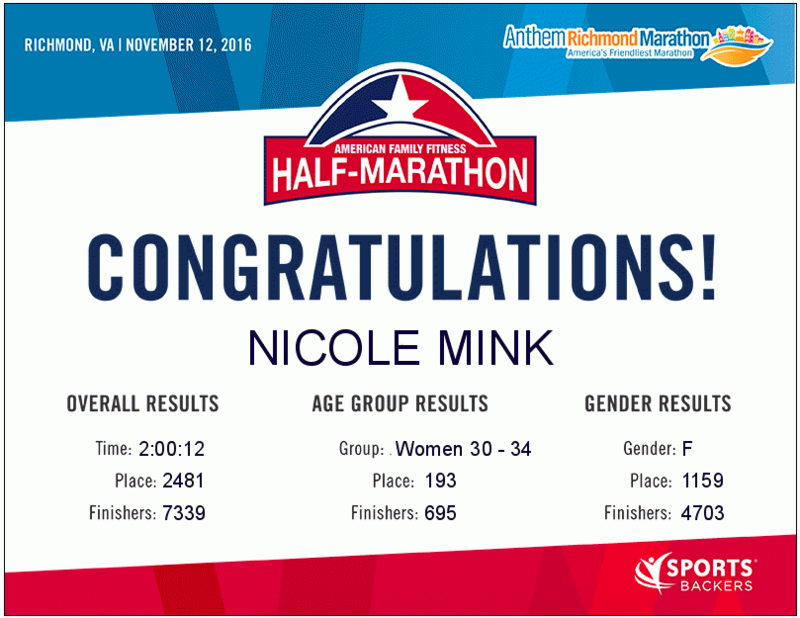 I set some pretty intense half marathon goals for myself back in January. Like I-N-T-E-N-S-E and then Patella Femoral Pain Syndrome, “runners knee”, happened and I’ve spent the past 3 months doing alternating walk/run (but not a trudge) training sessions. Can I say, discouraged? I mean all of my friends are setting fantastic PRs and getting to do amazing runs in the mountains and I’m running solo (for the most part). Waaahhh-ambulance called. Marathon weekend changed from a fun event for Jeremy and I (plus friends) to a solo girls weekend. Through various scenarios (financial freedom and an unexpected injury for him) the weekend morphed and changed several times prior to the event. It was touch-and-go there for a bit about whether I’d defer or carry on. In the end I chose to go and I’m so grateful I did. I got to celebrate with friends some huge accomplishments, new PR’s, first Marathons for 2, fueling mysteries resolved, race strategies sorted out and more. The weekend started out with a road trip. 3 girls from the No Pressure Running Group (NPRG) and I met up to drive to Richmond. Lots of giggles and girl talk and off we went! We started out at the Expo with a sensory overload along with hundreds of other runners. I gave into the expo-hype and bought a flip belt. Jeremy had researched this product for me before the expo so I had already been considering it as a solution for carrying my phone during the race. I tried it on at the expo and loved it; impulse purchase for the win! We took photos (tinged in green?). Look at this amazing group of women I get to run with! After the Expo we went to our friend’s in-laws home to “pre-game”. 8 of the girls in the NPRG stayed in the same home, along with extras. We laughed and teased, shared our nervousnesses, fixed watches so the settings for race day would be helpful and just had fun hanging out, not running. That evening we all bunked down sleep-over style and had fun giggling together as we fell asleep. Apparently this trip involved a lot of giggling! The next morning we got up insanely early. I think each of us slept approximately 4 hours. We all put on our race clothes with our throw away outfits on over the top and went to find parking. We all wore out some pretty awesome throw-away outfits; fashion fiascos but oh-so-fun. We arrived at the race, took care of turning in our drop bags, took a few more photos and then those of us running the half went to stand in line. Next time we race we’re standing with our friends and waiting for our wave to come to us. The wind tunnel Ellie and I stood in before the race was no bueno. This course is so cool because it feels like the entire city of Richmond comes out to support the runners. There might have been 10 feet of race course without someone cheering, yelling or holding a sign. So. Much. Fun. There’s music along the entire course, (but I still wore headphones) and the race is a good mix of park, residential and city. I ran with my friend Ellie until between miles 5 and 6 and then we parted ways. She’s one of the most positive, intentionally joyful women I know and she has a wicked sense of humor. We were laughing at various things along the way, including one unfortunate runner just fell before mile 3. We’re not sure what he tripped on but he went down hard; we may be mean people. Some wardrobe malfunctions happened for other runners and we were grateful for our careful preparations. Once Ellie and I parted ways I continued my pattern of walking 45 seconds every mile and just enjoyed the day. It was warm(er) in the sun, and freezing in the shade. The half marathon course and the full overlap at various points. The 4 mile mark and 20 mile mark run parallel, then from mile 8(ish)/21(ish) to the finish the routes are the same. This, for me, was an incredible experience. Four years ago when I ran the marathon, this portion of the course was M-I-S-E-R-A-B-L-E; I mean, I almost gave up on running after the marathon. It was a beautiful, redeeming process for me to enjoy the race for these 5 miles. I kept thinking, gosh I wish I were running hard here, but in spite of that, in spite of walking a portion of every mile, I knew my walking was intentional. I know my body is capable of (MUCH) faster speeds, but I wasn’t in mourning. I accepted that in order to run long term, taking care of myself right now is important. So I celebrated and I celebrated the experience. I smiled a lot during this 5 mile stretch. Some of the smiles were internal, some external. I prayed for my friends running behind me. I may have neglected the people in front of me when I prayed. I prayed that none of the marathon runners would catch me, let’s be honest. I prayed for happy races for my friends. I prayed for endurance. I prayed for a healthy mind game and a delightful day for each of them. 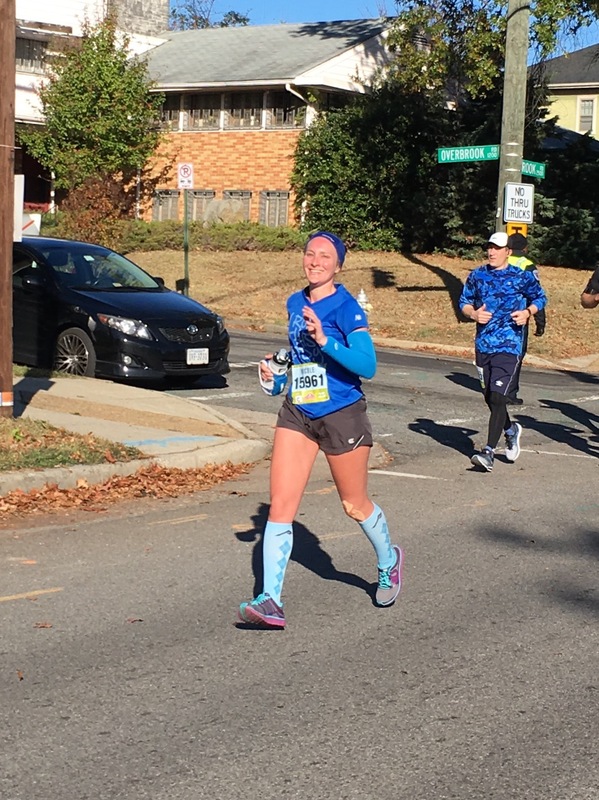 I crossed the 10 mile mark and told myself, “only a 5k left!” I crossed the 11 mile mark and thought, “only 2 miles to go!” I crossed the 13 mile mark and thought…”uh, where’s the finish line?” They have you finish the race heading toward Brown’s island. The last .2 miles are downhill. Let me tell you, downhill running (gravity running, as it is called) sounds like a great way to finish a race, but when your knees hurt, downhill is way worse than uphill. 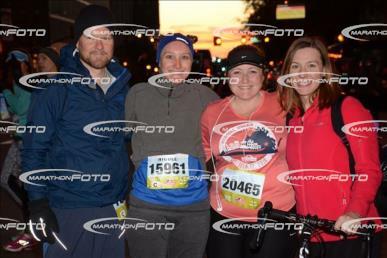 I was determined to smile my way across the finish line. I was jubilant at the end. I was able to celebrate this moment and mourn a bit over the injury, but celebrate nonetheless. I crossed the finish line at 2:17:14, my slowest road half marathon by far, but still faster than the first place marathon finisher. So there’s that ;). 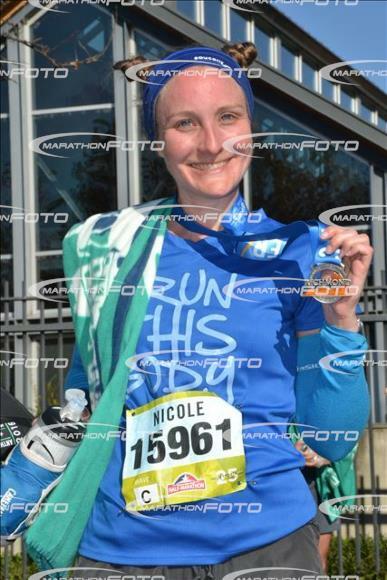 I walked smoothly down through the finish shoot, grabbed a water, my medal and… THE FINISHERS BLANKET! They give you a BLANKET at the finish. How wonderfully marvelous is THAT idea!!! I grabbed my drop bag; it was a brilliant idea to start in a wave way off my anticipated finish time because my drop bag truck had no line (sneaky, sneaky). After I found a quiet, dry place to change I removed wet clothing, found and ate some food, grabbed another water and went to watch the other finishers. My favorite finish line “performance” was a woman who had to be in her 60s. She took off her hot pink race shirt, leaving a white sports bra and pants, she swung her shirt around her head lasso style. Let’s be honest, she kinda needed to keep her shirt on. The crowd went wild, the announcer said, “Well, I told you all to celebrate!” I was giggling so hard! Other runners sprinted to the finish, some struggled every last step, but what an accomplishment for all! I caught up with some of the other runners and celebrated their accomplishments and then began waiting for the marathon finishers. I’m super proud of the girls who ran MMTR two weeks ago and then ran the marathon. Super proud to know and run with these women! Her first pair of Pearl Izumi N2’s had a full life. I volunteered to pace my friend Elisa at Mountain Masochist Trail Race. We were plotting out the course and where I would join her for several weeks leading up to the race. Shortly before the race we discovered another friend was volunteering at an aid station. To be specific she was volunteering at the Loop Aid station which encompassed miles 33 and 38. This portion of the race according to other runners is particularly grueling. There’s an intense climb/hike/crawl to the summit before continuing on for another 12 miles after completing the loop. Mentally and emotionally many of the runners come into this aid station really drained. Elisa knew this would be a challenging portion for her so she asked me to run with her during this segment. I also studied previous runner’s race reports to learn more about the segment I’d be running. I then pulled out my pacer app to figure out times and time of day that I could expect her at the aid station based on minute per mile. My running gear was packed according to Ragnar relay runner suggestions (ie: ziplock bag for each outfit) so that if I needed to jump in and pace a second runner I’d have a dry set of clothes and my used clothing could be zipped up air tight. Food was tricky, I would be at the aid station essentially all day, but with random running times I needed easily digestible items. 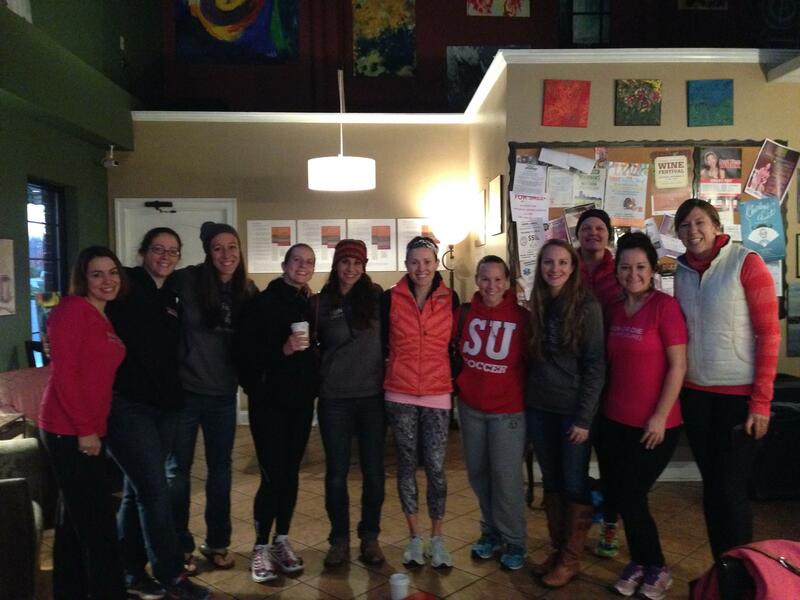 I had this nervous, excited energy going while I was preparing and praying for my runner friends that evening. I rode with my friends Jen, her husband Clif and Kristi. They graciously picked me up at 8 am and we drove up to Mt. Pleasant. Some of the participants in the race and aid stations camped out the night before the race so there was a toasty fire set up prior to our arrival. We left our gear near the fire. Once we arrived we jumped right in to food set up and prep. It takes a surprising amount of time to cut items into easy to grab portions and prep 5 gallon jugs of GU and water to support about 300 runners and decorate an aid station in a Christmas theme. We had some hang out time where I got to meet my awesome friend Nean. I’ve decided we’re basically sisters separated by several states. We had so much fun together. My friends Kelly and Susan were also helping at this aid station. It was so cool to share this experience with familiar faces and friends from my running community. Susan was supposed to run MMTR but because of an injury was unable. Kelly ended up pacing another of our friends, but more on that later! Once we were satisfied everything had been assembled we began the task of waiting on the racers! Jennifer and Nean considered the options for distributing the pop (soda/coke for those of you who might be confused). This race, in the spirit of “Leave No Trace” provided reusable, collapsible cups to all of the runners. This meant we weren’t supposed to use disposable cups, but let’s be honest, in a 50 mile race, it’s hard to remember ones own name, much less a reusable cup. We had a limited supply and to be quite honest some of the runners “might” have just chugged the coke straight from the bottle. Finally at 10:56 am the first runner arrived after 4 hours and 30 minutes on the course. We cheered him in to the aid station and the festivities began! We had runners in an intermittent stream from 10:56 until 4:45 pm! It was a lot of fun to watch the behind the scenes that occurs to support a race of this magnitude. 50 miles of trail means a lot of volunteers, crews and more. Working at 2 aid stations meant we saw the runners twice. Some runners went in strong and came out bloody while others went in desperately wishing it were over and came out looking stronger than they went in. It took awhile for the first female runner to come through, but for all of the girls waiting at our aid station it was momentous. We had fun watching the runners come through and calling out when we saw our friends. The girls from our running group racing today included: Alexis, Elisa, Kathie and Kim. We screamed like crazy for Alexis. She came through our aid station in the top 10 women runners. We were all super proud of her! Shortly before 1 pm Elisa’s family and crew arrived at our aid station. It was fun to meet her family and check in to see what I needed to consider as I ran with her. They said she was at a 12 minute mile approximately. She’s a really strong runner so I knew that with some encouragement she could make up time if she needed to while she had company, but with that pace she was on track to finish well under the 12 hour cut off. So I decided to play it by ear and figure out what she needed the most- a physical push or an emotional, mental boost while running together. Around 1:20 pm Elisa and Andy (her husband) arrived at the aid station. I had decided to run in shorts, a t-shirt and a long sleeve t (dumb move- I didn’t need the long sleeves, but I was in the mountains and the temperatures were hard to guess). I grabbed her water bottle to refill it while she stopped to check in with her family about any other supplies, etc. She dropped off her climbing poles, grabbed a GU, handed me a GU to carry for her and we set off. I started chattering away and she was able to maintain a conversation (indicating that she was feeling really strong and doing great). We caught up to Andy who was having a challenging time, I think we heard some grunts rather than words, but he’d run 33 miles by this point, no conversation expected. We kept going and enjoyed some single track, wide grassy areas and then a bouldering climb by a creek. It was a beautiful climb. I got nervous as I watched our pace drop slowly, but then I realized, “WE’RE CLIMBING A MOUNTAIN.” I told Elisa prior to the race that I’m not a strong hiker, so it must have been the adrenaline that kicked me into overdrive because we kept a solid pace to the summit. We climbed 1200 feet and we descended 1200 feet during our loop. I was a cruel pacer at the top and didn’t allow her much time to enjoy the view. I might have promised to return and hike it with her so we could enjoy the view on another day. The way up to the summit and the way back down posed an interesting challenge in that there was two way traffic in a single track, highly technical section in a part of the race when most of the runners were exhausted. We passed many of our running friends on the way up and back down. When we passed Kathie I quickly sang Happy Birthday to her in honor of her special day. Kelly was with her supporting and uplifting Kathie. Poor Kathie seemed pretty miserable for parts of the race, her stomach refused to be friendly, but she persevered and successfully finished the race. On our way down to the aid station I rattled off the list of food and drink available at the aid station. I’d watched many of the runners get to the table of food and get overwhelmed by all of the options that everything or nothing seemed appealing. I figured if she had the opportunity to hear the list her brain would acknowledge what her body needed without her eyes and stomach duking it out. She listed out several things that seemed to match what she’d been saying about various aches and pains. I told her I’d remember the list so she could just run, but we ended up making a game out of calling out the various items she’d be eating shortly as we ran down the path. She’d yell, “ramen!” I’d parry with, “ginger ale!” and we continued through her list. She mentioned changing shoes and socks at the aid station. I told her that sounded like a great idea, however I would not let her sit down to do so. I’d heard and read several race reports, suggestions, etc by experienced ultra runners that sitting down at that point in the race could very likely lead to not being able to get up. She was running strong so I didn’t want her to risk it. I kept encouraging her as we ran with, “you’re doing great,” “you look so strong,” “i’m so proud of you,” and more because she was genuinely doing a great job, I knew she could continue and she’d have a great race. I reminded her that she had less than a half marathon to do, and then it would be “just a 10 miler, and you run that so well” after that it would be “just a 10 k and that’s like a easy Wednesday morning run” then all she’d have left would be a 5K and then the finish! We arrived at the aid station at about 2:45 pm, a full hour before the cut-off time, and I called out what she said she wanted to the volunteers who were assisting runners and grabbed various items myself. I brought back the supplies to her and her crew. We grabbed some photos and sent her on her way. Her crew and Susan left shortly after that. I was torn at this point of wanting to keep going with her and knowing the volunteers at the aid station were vital, but figured I’d played my part for the day and hoped I’d get to see her finish. Thankfully, at this point I grabbed my change of clothes and found a place to get into dry clothing. The air was quickly telling me it would be in my best interest to no longer be in sweaty running gear. After I warmed back up I joined the volunteers to cheer for and support the remaining racers. I was particularly pleased to see a stronger Kathie come out of the loop. Kelly ran with her for a bit after she grabbed the necessary items at the aid station. Some more running friend were there at this point to cheer for and support Kim (Sunday and Kat). I was told Melissa was pacing Kim at this point. I questioned going in after her to help encourage and run her out, but Sunday and Kat were confident Melissa would pace her out in time. Finally at 3 minutes to cut-off Kim came through the aid station we all breathed sigh of relief. This was Kim’s second attempt at MMTR having missed the cutoff by seconds the year before she was extra determined to complete and finish this year in the time limit. After Kim left the aid station the tension in the air picked up because everyone volunteering realized a) the next runners through would have to be informed they hadn’t made the cutoff time and b) we didn’t have transportation for them so while they were not allowed to continue in the race they still had to run 3 more miles to the next aid station for transportation. We had to cut 2 runners from going into the loop and 26 after they came out. The time limits were set by the race director for safety of the runners and volunteers and while it is desperately frustrating to look at a runner who has trained for months, anticipated this race and already completed over 9 hours of running that day, and say, “you can go no further,” I understand the necessity. It was so painful. The last runner came out of the loop a full hour after the cut-off time. By this point we had completely packed up the aid station because we all wanted to get to the finish to cheer for our friends. The drive over the Blue Ridge Parkway to Montebello (finish line) was gorgeous. The fall foliage was breathtaking and the valleys were covered in shadows from the clouds and bright light where the sun shown through. I wish I had been in a more travel oriented mind set for this portion, but I just was so anxious about seeing my friends finish. I kept watching the clock praying we’d make it in time. While the runners had to cross 12 miles of terrain to get to the finish, by road it was a lot longer. I think it took us about 45 minutes to arrive at the finish line from our aid station. We made it to the finish just in time to see Elisa and Andy run the last quarter mile in to the finish. I was so excited I forgot to video record the finish and I only managed to take lame pictures, but I was proud of her nonetheless. I couldn’t believe how strong she looked at the end. So proud of my friend!! We waited around for a few more runners from the Lynchburg Trail Running Club (name change pending) and I managed to get video of Kathie’s finish. I congratulated each of my friends and left feeling honored to have participated in such a small part of the adventure. I still do not want to run an ultra myself, but I left excited to crew/pace/volunteer at another event. I’m moved in a very deep way by the athletes who choose ultra running as their passion.